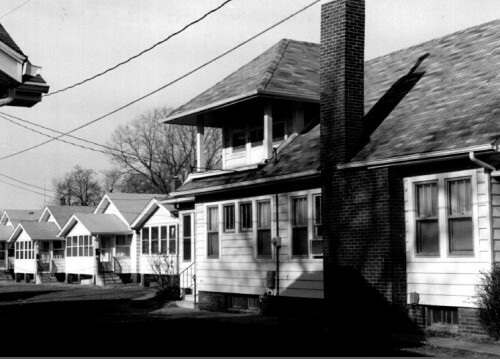 Veneman’s Bungalow Court is the latest of the three “bungalow courts” constructed in Des Moines during the period of popularity of the bungalow. Veneman’s Court dates to 1924-26. The courtyard design, with all but the two “entryway” bungalows facing onto a central courtyard and automobiles relegated to alleyways set behind the houses, recognizes the growing importance of the automobile while also de-emphasizing it by shunting it out of sight. Each rank of houses shares its own design. Those to the north have combination porch and main roofs with offset front porches. Those on the south have separate centered porch roofs.